« REGISTER NOW > Private Sales for The Promenade White Rock Condos by Intergulf > 18 Boutique White Rock Condominiums with $10,000 Decorating Allowance for First 5 Buyers! Wesgroup presents the new North Vancouver Prescott Condo Homes located in the desirable Central Lonsdale neighbourhood. Signature North Shore condo living is now here with contemporary architecture, concrete construction and upscale finishes in this highly sought after Central Lonsdale North Vancouver real estate location at 13th and Lonsdale Avenue. Home to the new North Shore Credit Union, the stunning Prescott North Vancouver condo tower is a twelve storey mid-rise condominium building will stand tall and will provide homebuyers an affordable opportunity to live in the city centre. The North Vancouver Prescott homes will feature oversized balconies and stunning water and city views. In fact, approximately 80% of the residences at The Prescott North Vancouver preconstruction condo tower will face directly south and give owners the ultimate panoramic views of both the downtown skyline and the water. Also, the North Van Presoctt SkyView Terrace Suites will be the ultimate home as the interior living spaces open onto private, oversized garden patios/terraces (with views). From studios to two bedroom and den floor plans, the 13th & Lonsdale North Vancouver Prescott condos for sale will start from the affordable pricing range in the mid $200’s, making them some of the best value in the Central Lonsdale corridor. This much anticipated project will be located at the top of a natural slope, providing expansive views for owners in addition to an awesome location. The 84 view residences at The Prescott North Vancouver condos for sale will have functional and very open concept floorplans that provide lots of in suite storage, laundry and other high-end finishes. Please visit www.theprescott.ca for more details as they are launched by Wesgroup. The Central Lonsdale North Vancouver Prescott Condos by Wesgroup provides limitless opportunities for condo buyers to get into this ground level opportunity in a newly revitalized locale. Here are the top five reasons you should consider purchasing your new North Shore home at The Prescott North Vancouver condo tower in Central Lonsdale. Firstly, the building itself is designed for spacious view residences with dramatic, panoramic views that sweep from Mount Baker to the Gulf Islands. Secondly, the new North Vancouver Prescott Condo Tower will feature design excellence – consciously shaped, intelligently positioned and designed with purpose by renowned architect Walter Francl. 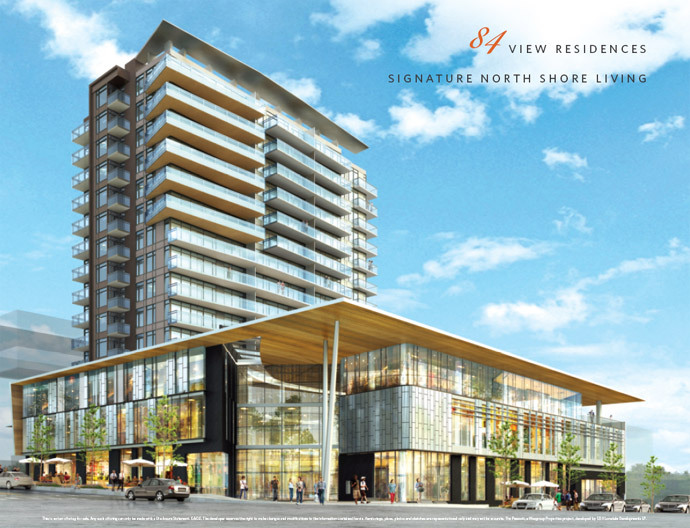 Thirdly, the new North Shore Prescott North Vancouver condos will have elevated outdoor living experiences – expansive decks and terraces that provide a seamless flow between your indoor and outdoor living spaces. The fourth reason why North Shore condo buyers should consider The Prescott in Central Lonsdale is because the building has the highest residential standards of energy efficiency in the City of North Vancouver real estate district, providing premier performance systems and technology. The fifth reason for buying at The Prescott North Vancouver condos is so that you can live with light and sky – spacious, elegant and tailored residential floorplans that have been designed to maximize natural south facing light and unparalleled views. The development team behind the Central Lonsdale North Vancouver Prescott view residences includes Wesgroup Developers, Walter Francl Architecture and AXIOM Builders. The upper level residences will feature more unobstructed south facing views for those looking for this added feature. The Prescott Viewpoint Homes in Central Lonsdale North Vancouver will be the view residences between Levels 5 through 9. The highest level homes are called The Prescott Infinity Homes which represent the infinite panoramic views to the north and south. These North Shore Prescott Infinity Homes are located from Levels 10 through 15 in this fifteen storey high-rise tower in Central Lonsdale. The floor plates from floor five through fifteen accommodate 7 units per level. The units facing directly west (Homes 3, 4 and 5) are all 2 Bedroom or 2 Bed+Den suites between 941 to 996 sqft with larger decks between 244 to 384 square feet. The other large Prescott floor plan is Home 02 which faces south and west and is a two bedroom plus den floorplan at 1,181 square footage with a decent sized deck of 255 sf. The north facing North Vancouver Central Lonsdale condos for the Viewpoint Homes and Prescott Infinity Homes will have great panoramas of the North Shore mountains and they range from 1 bedroom units between 552 to 616 sqft. The Prescott Condos are located in the desirable and exciting Central Lonsdale Neighbourhood in the City of North Vancouver real estate market on the corner of Lonsdale Avenue and 13th Street. The virtues of this walkable location are plentiful for condominium owners at the North Vancouver Prescott Condo tower – proximity to work, play, services, shopping, public transit, restaurants, malls, grocery shopping and parks. The Prescott North Vancouver preconstruction condos for sale consists of 84 view residences in 12-storey concrete building, above the future new head office and Lonsdale branch of the North Shore Credit Union. In terms of its location, you won’t find a more convenient place to live. Just within a 10 block radius, the Prescott North Vancouver preconstruction condos will be within walking distance to numerous retail stores, services, banks, schools, recreational/community centres, coffee shops, gas stations, and restaurants. Not only that, the Central Lonsdale North Vancouver Prescott Condos in the North Shore area will be a couple minutes away from the Lower Lonsdale area where you can jump on the seabus to downtown Vancouver. There are numerous parks and green spaces nearby as well as the three local North Shore mountains. The Prescott North Vancouver preconstruction condos for sale will also provide outstanding views as most of the homes face directly south, giving you panoramas and lots of natural light throughout the year. The new North Shore home you’ve been waiting for is now here at The Prescott by Wesgroup. The project site is on the south east corner of 13th & Lonsdale Avenue North Van. Please note that the “13th and Lonsdale” North Shore Credit Union project proposal is now being marketed as The Prescott North Vancouver Central Lonsdale condos for sale. The view residences will share the same project site as the North Shore Credit Union Main Headquarters and will feature many new community amenities including an art installation at the front entry. The Prescott North Shore Credit Union project will feature art from local artists and add more culture, entertainment and arts into the area, which is just fabulous. Please click on the link below for a video on the North Shore Credit Union/The Prescott art installation project going forward. The 13th and Lonsdale North Van real estate development is now called The Prescott by Wesgroup. This boutique Central Lonsdale North Van condo project is an artfully designed, mixed use building that will be comprised of a 12 storey concrete residential condominium tower with 84 view residences plus the new head office for the North Shore Credit Union. The Prescott North Van condos are inspired by Sewell Prescott Moody, the man who engineered, envisioned and inspired the community of Central Lonsdale North Vancouver. The 13th and Lonsdale North Van Prescott condos are now open for viewings and presales. Please register today. Once in a while an opportunity presents itself that is so special and rare, that it rises above all others, and beckons you to investigate further. 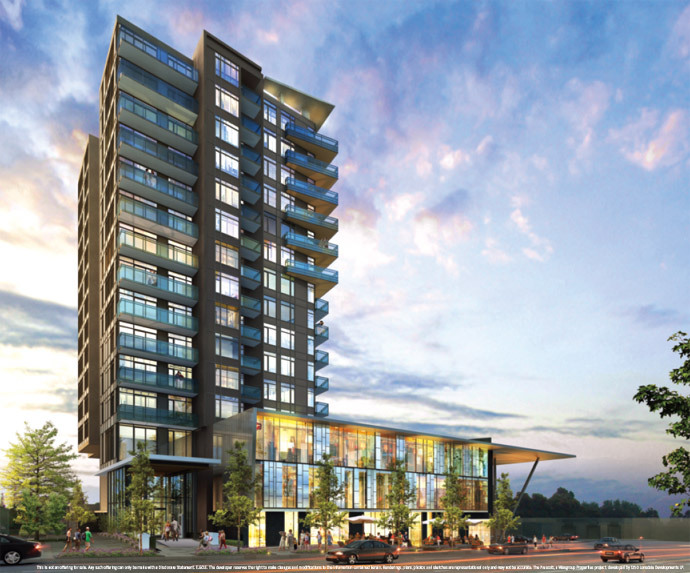 The Prescott North Vancouver condos is one such opportunity. Located within the vibrant community of Central Lonsdale, in the City of North Vancouver at 13th Street and Lonsdale, The Prescott condo’s statuesque, 15-storey design takes full advantage of its prominent location, upon the perch of Lonsdale – opening out to far reaching views from Mount Baker, to downtown Vancouver, and West to the Gulf Islands. Dramatic Views – Over 80% of the North Vancouver Prescott view residences will have spectacular panoramic southern or western water and city views. True Excellence in Design – consciously shaped, intelligently positioned and designed with purpose by renowned architect Walter Francl and developer Wesgroup Properties. Combined with the head office and flagship branch of the North Shore Credit Union, The Prescott North Vancouver condo tower will be a landmark Central Lonsdale condominium building for years to come. Elevated Outdoor Living Experiences – expansive decks and terraces grace every North Vancouver Prescott condo floor plan and provide a seamless flow between indoor and outdoor living. Two bedroom decks range from 158 square feet to impressive 634 square feet SkyView Terraces. Highest Residential Standards of Energy Efficiency in the City of North Vancouver real estate market – providing premier performance systems and technology. Live with Light and Sky – Spacious, elegant and tailored residential floorplans at The Prescott Condos in North Vancouver Central Lonsdale real estate market that have been designed to maximize natural light and unparalleled views. Exceptional Value – Pre-construction North Vancouver Prescott condo prices will start in the mid $200’s for Jr. Ones, Low $300’s for One Bedrooms, Mid $500’s for Two Bedrooms and High $500’s for Two Bedroom and Den Suites. The Prescott North Shore Condo Pre-View Centre, located at #101 – 1133 Lonsdale Avenue, will be open for private appointments commencing November 15, 2011. With only 84 homes available, and a very high level of interest so far, the opportunity to purchase at The Prescott North Vancouver condos for sale is limited. We’ve only recently opened The Prescott North Vancouver Condo Pre-View Centre and already the building is selling extremely well. Our wonderful new owners include longtime North Vancouver residents excited to call The Prescott North Shore their new home, younger move up and first time buyers, as well as parents purchasing future homes for their children. The Prescott North Vancouver condos has quickly become the new home community that friends refer friends to buy! The sales centre is offering Pre-Grand Opening Pricing until our last open day before the Christmas Break on December 19th. Please come see us soon, as prices and suite availability will not last long.